I do quite a bit of modeling and miniature figure painting. 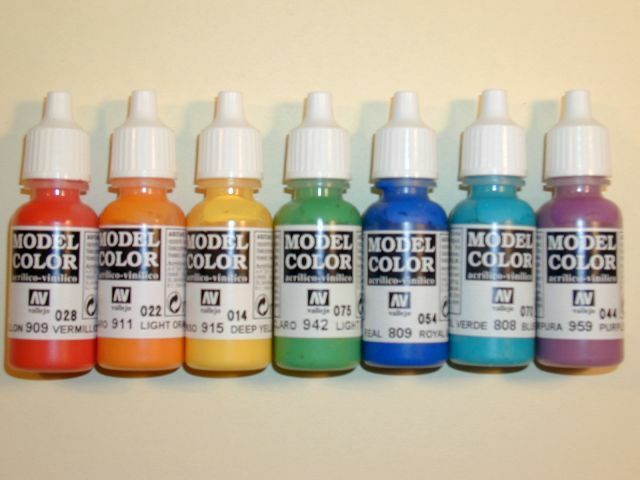 Recently I switched to Vallejo Acrylic paints which provide great opacity and coverage, but require a lot of mixing. Since the paints come in small drop dispensing bottles, it is not possible to stir the paints with a toothpick or wire. If you do not shake thoroughly, the pigment and the medium come out of the bottle in one miasmic clump. Often I shake the bottles for 2 or 3 minutes before using them. I thought to myself, wouldn't it be great to have a small machine do the mixing. 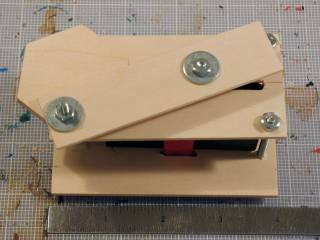 As a test, I rubber-banded a bottle to the blade of a reciprocating scroll saw. Success! The heavy-duty, high-torque motor mixed the bottle thoroughly in about 10 seconds. However, since I normally paint indoors, and I don't want to have a big power tool lying on the desk, I thought I would create my own hobby paint mixer for small bottles of paint. I went to my local Radio Shack store, a hobby store known for their selection of electronic parts and tools, and started selecting parts for the project. I knew I wanted a small, battery-powered motor driving a wheel. My preliminary sketches connected the wheel to a small plank which was fixed to the rotating wheel on one side and a linear channel on the other side. The bottle would be strapped to the small plank. One end of the plank would go in circles and the other end back and forth. 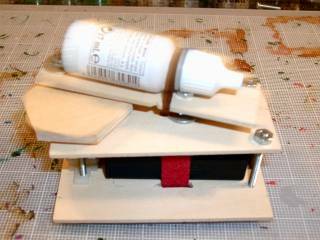 Interestingly, I mentioned to my wife that I was making a small paint mixer, and without hesitation she said, "What are you going to do, have a small motor with a wheel driving a seesaw?" Her design would be interesting to try as well. As shown in the picture, I selected a 3V DC motor, the cheap kind usually found in slot cars. This motor rotates at 8700 RPM under no load and provides 5.3 g/cm of torque. Some co-workers suggested a gasoline-powered weed trimmer motor, but that would be troublesome to run inside the house. 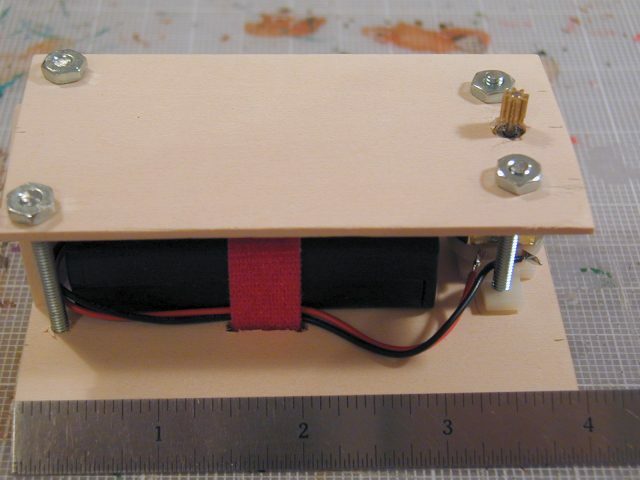 I also selected a double AA battery pack to provide the 3V, a switch to turn it on and off, and an assortment of machine screws and other doodads. For stock I would use 3/32" (1.0 mm) thick bass wood that I have lying around from other projects. I created a small platform with the gear of the motor poking through. Beneath the platform lie the battery pack and the on-off switch which is wired and soldered in series with one of the battery leads. 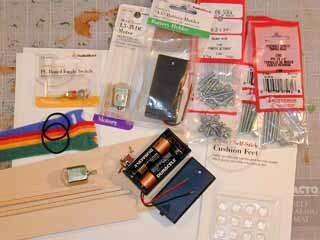 The hook and loop fastener band holds the batteries in place and allow you to remove the pack when the batteries weaken. Unfortunately, the tension of the metal screws cracked the wooden platform, so improvement number one would be to provide standoffs - small pipes to space the platform pieces and take the stress off them platforms. Next, atop the gear I mounted a small wooden hexagon to act as a rotating wheel. The hole in the center of the hexagon is drilled carefully to provide a tight friction fit over the metal gear. A slot is cut in the upper platform to provide the linear track for the one end of the top-most plank. As you see, this top-most plank, or bottle sled, has one end that move rotationally with the wheel and one end that moves linearly with the linear channel. The washers are slightly oversized since that's all I had in the parts bin. They are oiled to lessen friction. Click for a small (227 kB) MPEG movie of the mixer in motion. The final step is to strap a paint bottle to the sled and let 'er rip. This photo shows the bottle in motion. If you click on the image, you can view a short (227 kB) MPEG movie of the mixer in action. Ensure your movie player loops continuously to get an idea of the speed of the motor. Unfortunately, this version of a hobby paint mixer is unusable. Primarilly, the motor is not strong enough to power the paint bottle in orbit. While the package claimed 8500 RPM under no load, in practice the engine acheived about 60 to 100 RPM. This is slower than you can acheive mixing a bottle by hand. Additionally several of the bass wood planks and corners by the screws are splitting. I don't think the machine is reliable for long term use. Finally, the motor likes to walk itself across the desktop. Perhaps a heavier or wider platform is in order. Although this version of the paint mixer is destined for the scrap heap, all is not lost. This prototype provided invaluable insight for future generations of paint mixers. In fact, as soon as I was done with the project, I was already envisioning the next version. 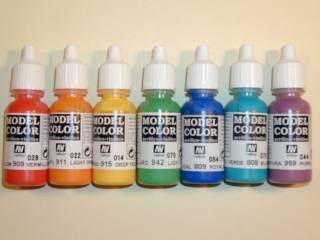 Thanks for reading thus far, but be sure to read on about the new and improved Mark II Hobby Paint Mixer. Last modified: Thursday, 09-Jun-2011 12:38:46 MST.